When my father, Jack, died last month at 85, the game of handball lost one of its greatest advocates. My father was devoted to the dwindling sport. He played twice a week and would cancel any interfering business or family obligation. 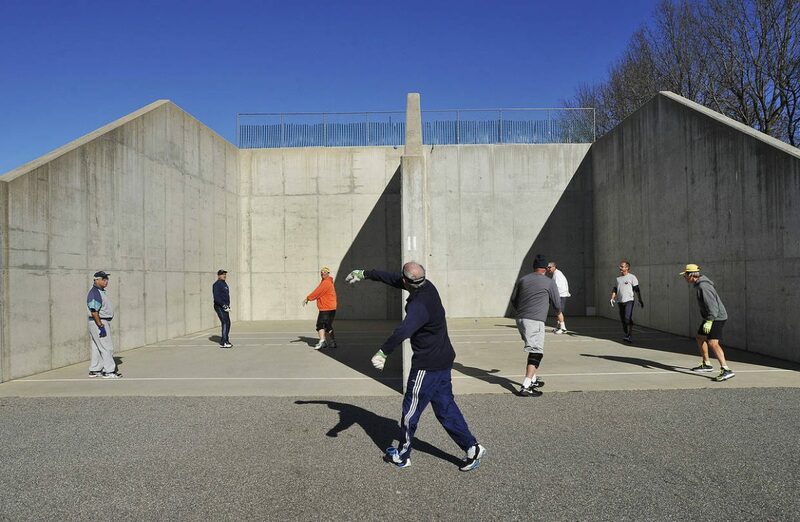 He started playing at 25 at the local Young Men’s and Women’s Hebrew Association near the University of Pittsburgh campus and was still at it until he got sick 18 months ago—although at 78 he stopped diving for shots. Is there a more egalitarian sport than handball? Some players learn the game in the military, some in the prison yard. All you need is a ball and at least one wall (my dad played four-wall), and usually some gloves. A look at a champions list favors the Irish (who invented the sport), Hispanics and members of Jewish Community Centers and YMCAs. The game is hurting because it’s hard to play. It requires some ambidextrousness, as you have to hit the ball from both sides. My failure ever to pick up handball disappointed my dad even more than my conservative politics. He tried to teach me, but my hands looked like sausage links once I took off the gloves. Hello, racquetball. Dad played wherever he traveled. His little black book contained phone numbers of handball players in Cape Cod and Sarasota, Fla., as well as our hometown of Pittsburgh. Before the Steelers won Super Bowl XIII in Miami, his foursome played at the Holy of Holies: the outdoor courts at Flamingo Park in South Beach. He would usually order a pitcher of beer a couple of weeks before his arrival in Sarasota to remind his buddies to make room for him in the game. He played doubles and was often paired with someone decades younger. My father was a dapper fellow, but on the court he looked like a hobo. His was a rags-to-affluence story, but when he donned his gear it was the other way around. In a frayed shirt, torn shorts, red doo rag and knee braces, he looked—possibly in an attempt to intimidate his opponents—like a character from “Mad Max.” His grandchildren sometimes watched from a balcony or behind a glass wall. He would throw in some extra diving shots to impress them. When he lost, he was down, sometimes for days. But after a win he would tell anyone, including a waiter, proudly complaining about the bruises he got from errant shots. We begged him to stop playing, fearing that he might die suddenly on the court. If only. The lung cancer that killed him caused much more suffering. Appeared in the January 3, 2019, print edition.